The track of Pluto across the night sky, as seen from 8 to 20 May 1997 when it was moving southwards in the direction of the constellation of Scorpius. North is at the top in this image. The superimposed red points are the moving point that the JCMT measured for the whole system of Pluto and its moons. Credit: Jane Greaves & George Bendo. (Phys.org) —In just over a year, the New Horizons spacecraft will fly past Pluto, giving us our first detailed look at the dwarf planet. Anticipating this encounter, St Andrews undergraduate student Ailsa Whitelaw and her supervisor Dr Jane Greaves have used forgotten data to map the sub-surface of Pluto, peering beneath its icy coating to uncover hidden chemicals that give a hint of the future of this distant world. Dr Greaves will present the new work in her talk on Wednesday 25 June at the National Astronomy Meeting (NAM 2014) in Portsmouth. Pluto is remote, orbiting at a distance of between 4.4 and 7.3 billion km from the Sun. For that reason even the best images, made using the Hubble Space Telescope, can only pick out features larger than a few hundred km in size on a world itself just 2300 km across. The dwarf planet rotates every 6.4 days, so researchers also observe Pluto using ground-based telescopes, looking at how its brightness varies to deduce whether light or dark features are facing the Earth and hence construct maps of its surface. Ailsa and Jane adopted a new approach, using data obtained from the James Clerk Maxwell Telescope (JCMT) on Hawaii in the late-1990s. JCMT's 'SCUBA' cameras operate in the sub-millimetre range of the spectrum, between far-infrared and microwave. Pluto was observed at 0.85 mm wavelength, meaning the waves are about 1000 times as long as our eyes can see and in a completely different region of the spectrum to any other data ever obtained from this distant world. The two scientists assembled a 'light curve', where brightness is plotted against time. 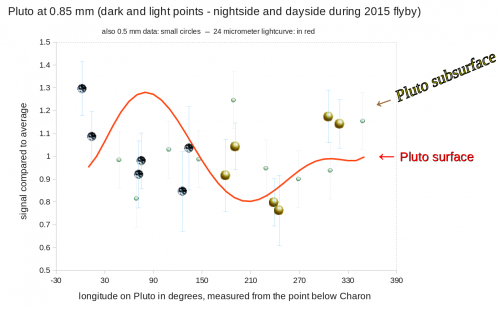 As Pluto is rotating, the data points correspond to different longitudes on its surface. 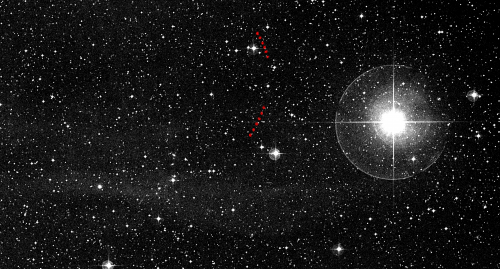 The 0.85 mm waves are emitted from beneath the surface of the dwarf planet as seen in visible light, hinting at a different chemical mix in the sub-soil. One possible explanation is that a relatively dry layer of frozen nitrogen and methane lies below a dark surface patch of water ice and frozen polymers. Because Pluto's surface slowly boils away in sunlight (eventually removing the dark patch), this also gives us a sneak preview of its appearance thousands of years in the future. As well as their forensic analysis of Pluto's past and future, the new results show a hemisphere of the dwarf planet that New Horizons will miss seeing in detail. The spacecraft zooms through the Pluto system on 14 July 2015, but only has a few minutes to study one side of the dwarf planet and its largest moon Charon at close range. Jane says: "This was a bit like using a telescope as a digger to mine into Pluto, but with less effort! I'm really excited to see what New Horizons will find a year from now. Some researchers think that even deeper down, Pluto has liquid water, kept fluid by remnant heat from a big crash that formed its moons - if so the surface will probably look wrinkled. But the flyby is so quick that we'll need to follow up – maybe with future radar we can dig down even further." The new ALMA telescope array now operating in Chile works at similar wavelengths and may be able to peer into the other icy dwarf planets discovered in the last decade.